We told you so. Last year, the Post-Gazette predicted that consumers would think hard about the food supply, would want to know their sellers and producers and would demand food that is fresh, local and sustainably grown. In 2008, expect that trend to go mainstream. More of us will shop at the stores that respect our needs. More of us will show up at farmers markets and spend more time in the kitchen, cooking from scratch. Or at least assembling good-for-you meals. The trend for local is being picked up by food manufacturers as well. Ready meals made with ingredients from the same region in which the product is sold are hitting stores. Food writers and pundits are turning their attention to this hot topic, following the lead of Michael Pollan's "The Omnivore's Dilemma," and Barbara Kingsolver's "Animal, Vegetable, Miracle." Expect consumers to put pressure on manufacturers and restaurant chains as they realize their power comes from a vote with their forks and shopping carts. This trend will continue to grow. Mark Bittman, author and journalist, just put out his latest tome: "How to Cook Everything Vegetarian: Simple Meatless Recipes for Great Food." When asked why he wrote such a comprehensive book on vegetarian cooking, Mr. Bittman said he "was seeing the handwriting on the wall" and that "the days of all meat, all the time ... could not go on." Even Deborah Madison's "Vegetarian Cooking for Everyone" was re-released this year -- after having sold more than 300,000 copies during the past decade. For some, going veggie will be a passing fad. For others, it'll be a life-changing habit. Green-itude is rampant. Homeowners and eateries alike will be pressured to reuse, recycle, use renewable resources and seek sustainably grown products. The National Restaurant Association has set up a Green Task Force. Soon you'll see visible rightousness showing up as menus printed on recycled paper, uniforms made out of wholly natural materials and a decrease in bottled waters. Come on, people, think of your planet! “We applaud the announcement by the Colorado Pork Producers Council to phase out the confinement of breeding pigs in gestation crates in Colorado, and transition to group housing systems over the next ten years. There are nearly 150,000 breeding sows in gestation crates in Colorado, and they deserve some semblance of basic humane treatment such as the ability to turn around and extend their limbs. Colorado joins Florida, Arizona, and Oregon porducers that already prohibit gestation crates. The largest pig producer in the world, Smithfield Foods, is phasing out its use of gestation crates. Maple Leaf Foods, Canada’s largest pig producer, is doing the same. And many major food retailers are moving away from supporting gestation crates and battery cages. 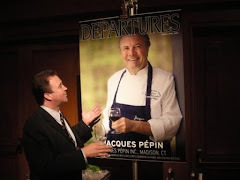 Wolfgang Puck is ending his use of pork from crated sows and eggs from caged hens. Burger King, Hardee’s, and Carl’s Jr. have started phasing in pork and eggs from producers that don’t use gestation crates and battery cages. And just this week, Compass Group, the world's largest food service provider, announced it is implementing a cage-free egg policy in the United States. Good, healthy and delicious processed foods come in many different kinds of packages and containers that protect the food from invading microbes and make them safe and available year round. This wasn't always true, of course. Either food was fresh or the food posed dangers, and the foods we've all come to enjoy whenever we want were only there when nature allowed them to be. While several kinds of protective techniques, packages, and containers exist, the two most prominent methods of processing food are still canning and freezing. The first acknowledged attempt at pressure cooking occurred in 1679 when French physicist, Denis Papin, who is most noted for his work with steam power, invented the “Steam Digester” in an effort to reduce the time needed to cook foods. This airtight cooking vessel used internal steam pressure to increase the boiling point of water, and as a consequence cooked foods faster. Nearly 100 years later towards the end of the 1700's the Napoleonic wars raged. As Napoleon pushed forward into Russia, the retreating Russian army left a stripped and ravaged countryside. Food was nearly impossible to come by and as a result, Napoleon's army was suffering more casualties from scurvy, malnutrition, and starvation than from enemy muskets. The French government offered 12,000 francs to anyone who could develop a method of preserving food. 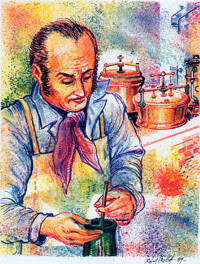 Nicolas Appert, an obscure candy-maker, brewer, and baker took up the challenge. He had a theory that if fresh foods were put in airtight containers and sufficient heat applied, they would keep. After 14 years of experimentation, he won the prize--given to him by Napoleon himself. Appert packed his foods in bottles, corked them, and submerged them in boiling water. Without realizing it, he sterilized them, stopping bacterial spoilage. Before the Frenchman became known for his inventions, Appert tried his hand at many occupations. 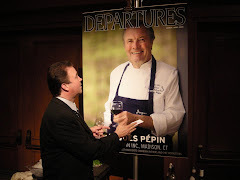 He began as a hotelkeeper, became a brewer, switched to chef and later was a confectioner in Paris. The House of Appert became the first commercial cannery in the world. Remarkably, this was nearly 50 years before Louis Pasteur proved that heat killed bacteria. The British responded directly to this development. If Napoleon's troops were able to extend their marches by carrying preserved nutritious supplies, His Majesty's forces must be prepared to do likewise. In 1810, King George III granted Peter Durand a patent for his idea of preserving food in "vessels of glass, pottery, tin, or other metals or fit materials." Durand solved the problem of bottles breaking in transit. Using tin-coated steel, Durand developed the "canister" with a soldered cover. Soon all over Britain people were eating "embalmed" meat, as they called it. An ambitious young man in London, England, William Underwood was intriqued by the idea of canned food. He apprenticed at Cross & Blackwell's factory before moving to Boston in 1819 to open William Underwood & Co. In 1821 he established a canning plant overlooking Boston Harbor. Underwood canned all kinds of products: vegetables, fruits, and condiments. He produced grape and mushroom catsup, jams and jellies, and mustard. In 1828 he shipped milk to South America. In 1835 he imported tomato seeds from England, grew his first crop, and preserved it. This was the beginning of canning in the United States. In 1860 he purchased the rights to advanced sterilization methods, and during the Civil War he canned roast beef for Union soldiers. Underwood (as in "deviled ham") is America's oldest canning company. Nearly a century later, a man named Clarence Birdseye was on an expedition in Labrador for the U.S. Geographic Service. While on the expedition, he noted that duck and caribou frozen in the extreme cold of midwinter were better than those frozen in the spring or fall. Knowing that mere freezing and cold storage would not preserve the quality and taste of the food, he concluded that the secret lay in rapid freezing at extremely low temperatures. He watched the Eskimos' rudimentary quick-freeze methods, a process by which items are frozen at such a speed that only small ice crystals are able to form, and noted that quickly frozen fish retained flavor and texture better than fish frozen slowly. In an early experiment in freezing vegetables, Birdseye, in order to provide fresh vegetables to his family in this remote area, froze cabbage for later use. 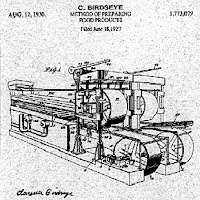 Back in the United States, Birdseye developed his "Multiplate Quick Freeze Machine" -- a crude operation. It consisted of a new garbage can of corrugated iron containing a layer of steel plates and fitted with coils carrying a refrigerant of sodium chloride brine. Food was placed between the steel plates, frozen at -40° F and kept there for five weeks. By 1925 Birdseye was in the frozen food business. His first product was frozen fish fillets, at the business he called The General Seafoods Company. He experimented with the process of quick freezing food that he had learned while in Labrador. He later said, "My contribution was to take Eskimo knowledge and the scientists' theories and adapt them to quantity production." Birdseye then applied his quick-freezing principle to meats, poultry, fruits, and vegetables. Birdseye made two major contributions to the concept of freezing food-the importance of freezing food so rapidly that there would be no damage to its cellular structure (affecting taste, texture, and appearance) and freezing food in a package that could be sold directly to the consumer. Initially unsuccessful with consumers, frozen food has since become an indispensable part of the American diet. The Birds Eye operation now thrives as part of Dean Foods Vegetable Company. If you're like a third of the people we know right now (ourselves included), you've got a cold. Although the medical community encourages increasing one's fluid intake when the plague sets in, it's unlikely that boozy drinks are on the list of approved beverages. Regardless, we've been craving warm, cozy drinks all week. When properly cleaned and maintained, griddles have a life cycle of between seven and 15 years, depending on the model and its usage. Figure out how often the operator will use the griddle and the anticipated production capacity. If the griddle will run a couple of hours a day, a heavy-duty model may not be necessary. If the operator will use the unit to prepare more than 25 percent of the menu items, consider a more durable griddle. The plate size and thickness will help determine how much food goes through the griddle at peak times. The thicker the griddle plate, the more heat it holds. Also, take into account the griddle size. In some kitchens, a narrower griddle with more depth can save a foot of hood space. Determine which type of surface material best suits the menu. Some units offer grooved plates that provide a seared appearance on meats. Decide if manual or thermostatic controls are necessary. While manual controls provide users with more latitude in terms of regulating temperature, thermostatic controls can be easier to use for novice cooks. Examine how the griddle handles grease and product fall-off. Check out the grease trough location and the width of the chute to ensure it can handle the challenges of the menu. Some models provide a back grease trough, in addition to side and front troughs, to better accommodate high-volume use. Consider whether the griddle will be mounted, freestanding or used on a countertop. Refrigerated bases are another option worth considering for smaller kitchens with limited space. One expert estimates that griddles stand idle about 70 percent of the time in full-service restaurants. Griddles with snap action-style controls only provide gas to the unit when it’s needed, saving energy. Look at the unit’s cleaning requirements. Some griddle surfaces are easier to clean than others that may require more time and labor. While standard griddle surfaces need to be scrubbed and seasoned, more costly chrome griddles are simply scraped and don’t require seasoning. Supplies of wild fish from rivers and oceans around the globe are dwindling, even as the demand for fish worldwide is growing. Aquaculture, or fish farming, is fast becoming the most convenient way for consumers to get fish. But, as Jan Sluizer reports, aquaculture is a new frontier in the modern world, fraught with promise and with challenges. Scientists, researchers, environmentalists, and fishermen are all in agreement with Corey Peet, an aquaculture research analyst at California's Monterey Bay Aquarium. There is a global fisheries crisis and if current practices continue, wild fish will be completely gone from the oceans in 40 years. "Seventy to 80 percent of fisheries are fished to capacity or over-exploited," he explains, "and one strategy to try to mitigate this problem is to grow the fish ourselves." Tim O'Shea's farmed fish comes from Mexico, Belize and Scotland. The San Francisco-based fish broker sells to local restaurants and markets. Believing that the key to successful fish farming is water quality and fish density, O'Shea has a face-to-face relationship with all his farmers, and insists on walking through each fish farm to get a personal understanding of the practices employed. "How is it harvested? How is it processed?" O'Shea says a good fish farmer must know and pay attention to the whole life cycle of a fish. "The illness of animals being grown in domestic cases is all about monitoring stress, by and large," he explains, "and so you're really attentive to mimicking natural patterns as much as you possibly can. That's what makes a good farmer; one who really looks to and thinks about what would this fish be doing naturally in its normal cycle? How can I duplicate that as well as I possibly can?" He says all these factors relate directly to the quality and value of what consumers get on their plate when they walk into a restaurant or a market. Peacock's Poultry Farm was founded in 1928 by George Peacock, and has continued as a family owned and operated business. Run by George, then his son Edsel, and today his grandson Gerald. 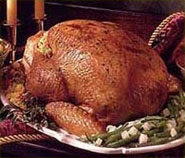 In the early days, turkeys, chickens, and pigs roamed free on the 10 acre farm in Troy, Michigan. At that time, most of the products sold at the farm were actually raised, slaughtered and packaged on the site. Due to the growing demand for the high quality products for which Peacock's had become known, other sources were needed to fill the flood of orders. In 1970, Edsel Peacock was looking for a reliable source of farm-raised poultry and beef that met Peacock's high standards.Someone put him in touch with the Amish in Indiana. 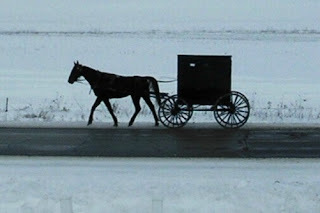 This was the beginning of a long relationship between Peacock's and the Amish farmers, which continues today. The most important factor being that the chickens, turkeys, ducks, and beef are raised and sold without any chemicals or preservatives. Today Peacock's is run by Gerald, his wife Merilyn, and their daughters Lora & Cyndi. The farm has gone through many changes since 1928, but the high quality and outstanding service remains the same. Amish chickens are all natural. NO growth hormones ... NO preservatives ... just great tasting chicken in the Amish tradition's. These chickens also have less fat and more meat. That's because the chickens are not force fed. They grow at their own pace to stay tender and lean. And that means more great tasting chicken for your money. Amish chickens are raised in open, spacious houses with plenty of fresh air and water. That way, they grow healthy and are delivered to your store firm and white, not yellow. 1. We hand process every chicken fresh everyday. 2. We use pure water for cleaning and chilling from our own wells. 3. We use low-fat feed so our chickens have more meat and less fat. 4. We grow our chickens slower so they taste better and are healthier. 5. We raise our chickens in the natural, traditional Amish manner. 6. We take pride in our work, and make sure we deliver the best poultry available anywhere. 1. We don't use preservatives. 2. We don't use chlorine. 3. We don't use growth hormones, or stimulants. 4. We don't ship our chickens cross-country so they get old before you get them. 5. We don't compromise on quality or good taste. The House is getting a food service makeover as part of Speaker Nancy Pelosi's "Green the Capitol" Initiative (speaker.gov/newsroom/reports?id=0019). Out go the yucky, conventional, sweetened and fatty servings, and in come locally grown, grass-fed and organic Berkeley-style cuisines. It is a bowl the size a monkey would use. It is a bowl that was originally made from a monkey's skull. It is a shallow bowl the size of a monkey's hand. Royalty once had small portions of their food fed to monkeys to be sure it wasn't poisoned. Bell hops wore caps similar to those worn by organ grinder monkeys. The bell hops became known as 'monkeys,' and the smaller dishes were used by these 'monkeys' to serve in-room guests. When it comes to sourcing sustainable seafood, lots of buyers can talk the talk (their suppliers certainly can). Environmental awareness is a growing consumer trend and retailers and restaurants with green philosophies can sell themselves to like-minded shoppers and diners. But The Oceanaire Seafood Room took its sustainability commitment to another level recently by purchasing an entire boatload of Alaska king crab harvested by one of the "Deadliest Catch" skippers. Wade Wiestling, VP of culinary development, says the Minneapolis-based company has never made such a bold purchase, in terms of either size or statement. One trip's worth of Bering Sea king crabs trapped by the Time Bandit — approximately 40,000 pounds of frozen clusters after processing — will begin arriving by the end of the week and will supply the 14-unit chain with king crab through the holidays. "We've never committed to one product like this. And with the popularity of that product and the Discovery Channel show, it gives us remarkable marketing tie-ins," admits Wiestling, who's been with the company since its inception in 1999. "But we did it mainly for the quality of the crab and the familiarity with the crew." The idea was born this fall when Wiestling took three of his chefs to Dutch Harbor for the Crab Connoisseur trip sponsored by The Crab Broker of Las Vegas, which arranged the unique sale. Wiestling, who says Oceanaire has purchased Russian crabs in the past, is aware of the illegal-fishing concerns surrounding imported Russian king crabs. Meeting the Time Bandit crew and seeing firsthand what they did at sea gave Wiestling a new perspective on buying Alaska seafood. "It made sense from a marketing and sustainability standpoint to 'bite off more than we can chew' with Alaska crab, because it is an important fishery and it's a limited harvesting season," says Wiestling. "We knew the quality and the way it was processed would be a great story for our staff on the floor. Seemed like the right thing to do." The foundation of any great stock is the bones. Bonewerks starts with fresh bones and oven roasts them to perfection. After adding the perfect blend of fresh vegetables, herbs, and spices, our chefs carefully monitor them in Bonewerks' state-of-the-art kitchen. The process of simmering, skimming, and reducing takes more than 24 hours per batch! Bonewerks, originally called CulinArte´, was founded in 1998 in Green Bay, Wisconsin. The company offers chefs a world exclusive—a line of pure and all-natural traditional stock reductions, providing them with the luxury of having the foundations for great sauces at their fingertips. Time and again the extraordinary purity of Bonewerks Glace and Demi Glace products is compared to those of an in-house master saucier, allowing Bonewerks to quietly become the leader in today's sauce and sous vide industry. Using premium ingredients—purified water, fresh bones, and farm-fresh vegetables and herbs—allows us to create products that taste better, perform better, and are simply better for you! Our Glace line is true to form, using only a single species of bones. They are 100% pure, all natural, with no salt, wheat-free, gluten-free, no added gelatin, no artificial coloring, no added flavors, no dairy, no extracts, fat-free, trans fat-free, and carb-free. Win $50 Case, Ski Lift Tickets Or An IPOD! Spin The Duck Prize Wheel! An Associated Press Article says that growing demand in rapidly developing countries such as China and India for processed food and expensive meat and dairy products is driving up prices for those goods, as well as for staple grains used to feed cattle. In addition, switching to crops used for biofuels will also reduce the amount of available food and increase prices. The article that appeared December 4th is based on a report by theInternational Food Policy Research Institute. So I heard a story today about a server at a restaurant in Santa Monica called The Buffalo Club getting a $10,000. tip from Donald Trump. Apparently the server had no idea he was going to be waiting on the Donald, and when he tried to run through the days menu highlights he felt completely ignored. The Donald commented on his terrific service as he left and dropped $10K on the tip line. You just never know do you? You can read the story and see the check at derober.com. The first Iberico ham from Spain will debut Thursday at Washington's Jaleo restaurant, where it will be served to guests including the Spanish ambassador, the New York Times reported. USDA has approved only one producer, Embutidos Fermin of La Alberca, Spain, to export the hams to the United States. The first shipment of 300 hams will be sold by various restaurants and shops over the next few weeks for more than $50 a pound. The ham, which comes from the black-footed, or pata negra, pigs of western Spain, takes more than two years to cure. Mussels, cultured in the cool water surrounding Prince Edward Island, are rapidly becoming one of North America's most popular seafoods. Although wild mussels, which grow abundantly along shorelines, have long been regarded as trash seafood, people are now becoming aware that cultured mussels are very different. Cultured mussels are grown in mesh stockings that are suspended from longlines (ropes) in the water. Because they never touch the ocean bottom and the ideal conditions promote rapid growth, cultured mussels taste sweeter, are more tender, are plumper, are free of grit and have a higher meat yield than their wild counterpart. As well as being tasty, mussels are nutritious. They are particularly rich in protein and minerals while being low in fat and cholestrol. 3.5 oz (100 g) of mussel meats contain 95 calories, 14.4 g protein, 2.2 g fat, 88 mg. calcium, 3.4 mg. iron and 289 mg sodium. Mussels are very easy to identify. They are a bi-valve shellfish that measures from two to three inches in length. The shell is primarily a blackish colour with bluish highlights and has an elongated triangular shape. 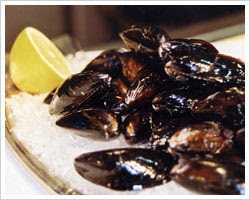 Mussels are traditionally marketed fresh in the shell. The shells are usually closed tightly but they may open slightly when left undisturbed. When purchasing mussels check any open shells by tapping them. If the shells do not close when tapped, they should be discarded. It is relatively easy to distinguish between wild and cultured mussels. Wild mussels, which are a dull bluish colour with white erosion marks, usually have seaweeds or barnacles attached. 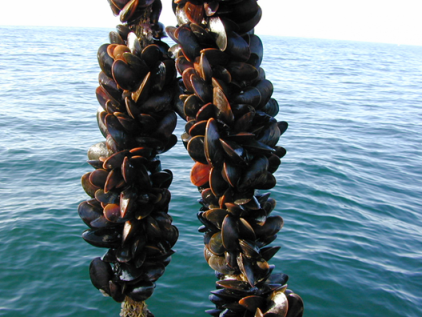 In contrast, cultured mussels have shiny bluish-black shells, free of barnacles and seaweeds. Fresh mussels may be stored in the shell in the coolest part of your refrigerator for five to eight days. To keep them moist, cover with a damp cloth or wet newspaper. They should not be stored in an air-tight container or in water. The less mussels are disturbed, the longer they will remain alive; therefore, the time to clean them is just before cooking. Cooked mussels may be frozen by placing the shucked meats in plastic containers and covering them with a brine solution of 1 teaspoon (5 ml) salt to 1 cup (250 ml) of water. Allow 1/2 inch (1 cm) head space for expansion during freezing. Mussels frozen in this state will store for 3-4 months. If mussels are to be frozen in the shell, they should first be blanched in boiling water for 20 seconds, then drained and packed in heavy plastic bags or plastic containers. Storage time for mussels frozen in the shell is approximately 2 months. Here are a few items now available. Please make sure you give us at least 48-72 hours to track the product down for you. Veggie Sweet Peppers - from Baja, are in full swing. Supplies are plentiful. Mediterranean Sweet Lemons (AKA Sweet Limes, even though yellow like a lemon) - from California. 25 lb. carton. Available for a few more weeks, please pre-order. flavor. Pearls available in 10/2 lb. mesh bags. Ruby in 50# bulk only. Trans fat is the common name for a type of unsaturated fat with trans isomer fatty acid(s). A particular class of trans fats occurs, in small quantities, in meat and dairy products. Most trans fats consumed today, however, are industrially created as a side effect of hydrogenation of plant oils. The end effect of hydrogenation is to add hydrogen atoms to unsaturated fats, making them more saturated. These more saturated fats have a higher melting point and a reduced tendency for oxidation, resulting in a longer shelf-life. Wilhelm Normann was a German chemist who introduced the hydrogenation of fats in 1901, which had a profound influence on the production of margarine. He patented the process in 1902. In 1909, Procter & Gamble acquired the US rights to the Normann patent then, in 1911, they began marketing the first hydrogenated shortening, Crisco (composed largely of partially hydrogenated cottonseed oil). Further success came from the marketing technique of giving away free cookbooks in which every recipe called for Crisco. Production of hydrogenated fats increased steadily until the 1960s as processed vegetable fats replaced animal fats in the US and other western countries. At first, the argument was a financial one due to lower costs; however, advocates also said that the unsaturated trans fats of margarine were healthier than the saturated fats of butter. Trans fats in hydrogenated vegetable oil causes an increase in blood levels of low-density lipoprotein, or LDL, which is commonly known as “bad cholesterol.” LDL’s job is to transport cholesterol to the tissues of the body, and it can wreak havoc on its way. “As LDL travels through the blood [carrying cholesterol to the tissues], it can deposit some of the cholesterol in the arteries, leading to plaques and atherosclerosis,” explains James Ntambi, a professor of biochemistry and nutritional sciences. Ntambi notes that, on the other hand, HDL, or “good cholesterol,” transports cholesterol to the liver, where it is destroyed and excreted from the body. The polyunsaturated fat known as omega-3 fatty acid increases HDL levels and is considered heart-healthy. It is found in the oil of many types of fish. More generally, all unsaturated fats — both polyunsaturated and monounsaturated — are considered healthful, in the sense that they do not increase risk for heart disease. Unsaturated fats are found in vegetable oils and nuts, in addition to fish. Although Crisco has already developed a trans fat-free product and others are doing the same, “Nabisco and Kraft can’t buy as much [trans fat-free oils] as they need at this point,” says Barbara Ingham, an associate professor of food science. To replace trans fats, many food producers are reaching for saturated fats such as palm oil, coconut oil and cocoa butter. Unfortunately, saturated fats don’t offer much of a health benefit over trans fats, if any. The USDA lumps trans fats and saturated fats together; both types raise LDL and are considered unhealthful. Trans fat-free french fries are not significantly healthier, says UW–Madison nutritionist Sherry Tanumihardjo, because “even though restaurants in New York will be taking out the bad guy [trans fats], they are adding back saturated fats.